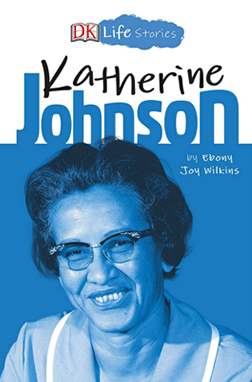 KATHERINE JOHNSON by author and educator EBONY JOY WILKINS, Ph.D. It was an incredible accomplishment when the United States first put a person on the moon–but without the incredible behind-the-scenes work of NASA mathematician Katherine Johnson, such a feat could not have been possible. In this biography for kids ages 8-12, follow Katherine’s remarkable journey from growing up in West Virginia, to becoming a teacher, to breaking barriers at NASA and receiving the Presidential Medal of Freedom in 2015. 1. Katherine was a skilled mathematician. She used her talents to help put a man on the moon. Think of your own skillset. How can you use your skills to benefit your community? School? Home? 2. Think of your strengths and weaknesses. What do you do well? What do you plan to work on to improve upon your weaknesses? 3. Most people know that Katherine was a mathematician, but few people know that she was also a teacher. What skills (or talents) do you possess that no one knows about? How will you share your hidden talents? 4. If you had the chance to fly to space, what three items would you take with you? Explain why you chose these three. 5. If you wanted to write a story about your school experiences, what would your story look like? Would you write about yourself or someone close to you? What message would you like to send to your readers?